The Warren Group reported that the median price for single-family homes dropped 5.8 percent from $313,000 in November 2006 to $295,000 in November 2007. The year-to-date median price for single-family homes fell 4.7 percent from $327,000 last year to $311,705 this year. Because of the rapidly rising rate of foreclosures, The Warren Group has decided to also calculate data that excludes the effects of foreclosures deeds. Using this method, the median price of single-family homes has stayed nearly steady year-to-date, falling less than a half percent from $335,000 last year to $334,900 this year. November’s median price, when calculated with this method, fell just 1.6 percent from $325,000 to $319,900. In a 5-0 vote, the Federal Reserve moved to propose new mortgage loan rules in an effort to protect home buyers from ethically challenged mortgage brokers and others in the lending industry, the Boston Herald reported December 18, 2007. The proposed rules would restrict lenders from penalizing risky borrowers who pay loans off early, require lenders to make sure these borrowers set aside money to pay for taxes and insurance and bar lenders from making loans without proof of a borrower’s income. The new rules also would prohibit lenders from lending without considering a borrower’s ability to repay a home loan from sources other than the home’s value. Makes you wonder what took so long. Even innocent tenants that are reliably paying their rent are being evicted by banks foreclosing on the property they live in, The Boston Globe reported December 17, 2007. Many banks are refusing to sell properties with tenants on the premises, even when buyers are willing to buy those properties. "The question is whether lenders and other companies that own these buildings will agree to sell the buildings with tenants still in them. [One potential buyer] has been turned down twice. According to local real estate professionals, others who have inquired about buying foreclosed properties in Boston also have been turned away." In a December 22, 2007 article, The Boston Globe reported that tenants in some foreclosed Boston apartment buildings are living without adequate heat because banks that now own the properties have not repaired broken heating systems or paid for the delivery of heating oil. "Some foreclosed buildings also lack electricity, or hot water, or even running water, and the tenants may have no one to call: The new landlords often fail to provide tenants with a contact number, as required by Massachusetts law. And when landlords can be reached, the response is often so limited - half a tank of heating oil, for example - that the problems recur within a few days." The Globe reported December 27, 2007 that heat had been restored to some apartment buildings that were experiencing problems with heat. President Bush signed legislation that will provide financial relief for homeowners facing foreclosure or in bankruptcy, the Boston Herald reported December 20, 2007. "The bill gives a tax break to homeowners who have mortgage debt forgiven as part of a foreclosure or renegotiation of a loan. No taxes would be owed on the value of any debt forgiven or written off. Currently such debt forgiveness is taxable income." It is anticipated to reduce taxes for some homeowners by $650 million; however, the cost to the government would be offset in part by limiting a tax break available on the sale of second homes. financial decisions, you get a tax break. Happy holidays! The following reflects market numbers between December 7 and December 13, 2007, according to The Warren Group. The free widget below provides a basic analysis of a property's investment potential. A paid version also is available and provides more flexibility in the way data can be imputed and analyzed, but the free version below provides a decent analysis. I tell clients interested in investment properties who want to take a conservative, and I would suggest smart, approach to investing in real estate, such as a multi-family property, to assume rental property will be rented 45 months out of the next 60 months (on average nine months per year). For example, if the rental income is $2,400 per month, then multiply $2,400 by nine to get a conservative estimate of annual income. Your property may be fully rented in the first two years, but vacant nine months in year three. You just can't predict it. If it does better than that, great, you have that much more cash to invest in your second property. Of course, if you plan to occupy a part of the property, then your analysis would be a little different. If it is a commercial property, and you are certain you can obtain a long-term lease with a financially solid tenant (two big "ifs"), using 45 months rented out of the next 60 for your analysis might be a little too conservative. Use the link in the right-hand column to get foreclosure property listings in communities you are interested in. Undersecretary of the United States Treasury for Domestic Finance, Robert Steel, spoke with National Public Radio on December 14, 2007 and defended the Bush Administration's decision to make it's subprime mortgage plan voluntary. One of the largest investors in mortgages in the U.S., Freddie Mac, has produced a video about how to spot foreclosure scams and avoid becoming a victim of a fraud artist. Freddie Mac decided to produce the anti-fraud video for YouTube after a 2007 company-sponsored study discovered that 25 percent of delinquent borrowers go to the Internet first for mortgage information, only slightly less than the number who called their mortgage lender (28 percent) or bank (32 percent). According to a press release, Freddie Mac is a stockholder-owned corporation established by Congress in 1970 to support homeownership and rental housing. Freddie Mac purchases single-family and multi-family residential mortgages and mortgage-related securities, which it finances primarily by issuing mortgage-related securities and debt instruments in the capital markets. Over the years, Freddie Mac has made home ownership possible more than 50 million times, ensuring financing for one in six home buyers and more than four million renters. This Reuters video from August 2007 discusses foreclosure scams, and how the ethically challenged (aka, scum bags) prey on those facing foreclosure. 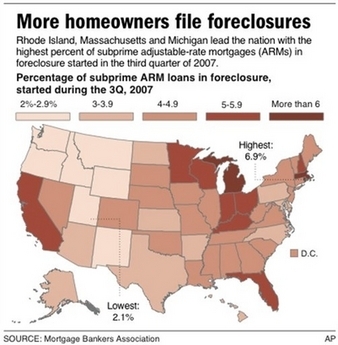 With foreclosures piling up, subprime lenders have fled Massachusetts. Eight of the ten largest subprime mortgage specialists in Massachusetts are no longer lending in the state, the Boston Herald reported December 3, 2007. "Eric Rosengren, head of the Federal Reserve Bank of Boston, says that the only two such lenders still operating in Massachusetts are Option One Mortgage and First Franklin Financial." How's That MA Subprime Loan Treating You? The foreclosure statistics in Massachusetts are ugly. Massachusetts ranks fifth in the nation for the share of subprime borrowers who have fallen behind on their mortgage payments, reporter Binyamin Appelbaum wrote December 6, 2007 in a post on The Boston Globe's real estate blog. Massachusetts trailed only Ohio, Michigan, Mississippi and Rhode Island, according to Mortgage Bankers Association data. "Ovearll [sic], about 236 in every 1000 subprime borrowers have fallen behind on their payments, including those now facing foreclosure. In Massachusetts, the number is about 284 in 10000 subprime borrowers. (Both numbers exclude those who have already foreclosed, a rapidly expanding group whose inclusion would make the overall picture that much bleaker.)" Not surprisingly, the situation is better among prime borrowers. Only 33 in 1000 are behind on their mortgage loan payments. USA Today compiled a state-by-state mortgage delinquency and foreclosure chart. The chart's figures are valid through the third quarter of 2007. The date comes from the Mortgage Bankers Association. RealtyTrac also released state-by-state foreclosure statistics. The Boston Globe reported on December 7, 2007 about the "fine print" in the Bush Administration's subprime plan. The following links are some of the many news reports about the Bush Administration's subprime mortgage plan. The plan, which is the result of a deal between the Administration and lenders and not a new law, would freeze some subprime loan rates that are scheduled to rise in the coming months. The freeze will last five years. Some 2 million subprime borrowers have adjustable rate mortgages that will reset to higher levels in 2008 and 2009, but only about 10 percent would be eligible for the freeze, according to news reports. To qualify, those borrowers have to be current on their loans, and lenders have to determine that the owner can't refinance or afford an adjustment. The freeze will only affect those whose payments would increase by more than 10 percent with an adjustment. A report by financial analysis firm Global Insight predicts foreclosures will negatively impact the economy in many metropolitan areas of the United States. The report for the U.S. Conference of Mayors, "The Mortgage Crisis: Economic and Fiscal Implications for Metro Areas," examines the effects of the "housing recession" and mortgage crisis on the economic growth prospects for 361 of the nation's metropolitan areas. "Weak residential investment, lower spending and income in the construction industries, as well as curtailed consumer spending resulting from decreased home equity will have 'multiplier effects' on the nation's economy"
The foreclosure crisis alone will reduce home values by an additional $519 billion in 2008, bringing the total forecast of lost equity for the nation's homeowners to $1.2 trillion. In 2008, the economy will grow at a rate of 1.9 percent, a full percentage point lower than would have been the case without the mortgage crisis. Home price declines across the United States will average 7 percent in 2008, ranging as high as 16 percent in California. Consumer spending will slip to 2.0 percent growth, well below a 3.1% gain in incomes. Sales of existing homes also will continue to fall, by another 10 percent in 2008. Of course under a new plan released by the Bush Administration to the press on December 5, 2007 some mortgage loan rates would be frozen. Such a move would at least delay foreclosure for some home owner's and put into question some of the above predictions.